The purpose of this study was to assess the safety and efficacy of multispot laser and conventional laser in the treatment of nonproliferative diabetic retinopathy with clinically significant macular oedema (CSME) in relation to the visual outcome, central macular thickness (CMT) using optical coherence tomography, and presence of adverse events. This prospective randomized study included a total of 50 eyes from the research institute of ophthalmology in 2015 that were divided into two groups of 25 patients each. Group A patients underwent focal or modified grid macular laser photocoagulation using green laser 532 nm. Group B patients underwent focal or modified grid macular laser photocoagulation using multispot laser photocoagulation Valon TT. Inclusion criteria were as follows: type II diabetes and clinically significant macular edema. Best-corrected visual acuity (BCVA), optical coherence tomography readings, intraocular pressure (IOP), and adverse events were recorded preoperatively and at 1 week, 1 month, and 3 months postoperatively. The mean preoperative BCVA in conventional laser was 0.294 ± 0.17 decimal and that in multispot laser was 0.30 ± 0.21. The mean BCVA 3 months after laser in group A was 0.4820 ± 0.244 decimal (P = 0.001) and that in group B was 0.50 ± 0.20 (P = 0.001). The mean preoperative CMT in group A was 375.92 ± 65.69 μm and that in group B was 361.0 ± 50.400 μm. The mean CMT 3 months after laser in group A was 314.44 ± 85.94 μm (P = 0.001) um and that in group B was 0322.67 ± 57.50 μm (P = 0.001). The multispot system parameters used a higher power of 155 ± 90.1 mW (P = 0.001) compared with the conventional laser to produce the same therapeutic visible effect. Multispot system was safe, rapid, and effective in the treatment of clinically significant macular edema in short-term follow-up periods and had a short exposure time. Although the short pulse duration of the multispot system necessitated the use of a higher power, it was not associated with adverse effects. Laser photocoagulation remains the second most common eye procedure after cataract extraction, and yet little has changed in laser design over the last 35 years until recently. There are different colors and different laser sources and connecting cables, but otherwise the same single-spot delivery system coupled with a slit lamp controlled by a joy stick is still in use . The Early Treatment Diabetic Retinopathy Study was a landmark trial that firmly established laser photocoagulation as one of the treatments for diabetic maculopathy. The study showed that, for eyes with clinically significant macular edema (CSMO), the rate of moderate visual loss [a doubling of the visual angle (15 or more letter loss on Early Treatment Diabetic Retinopathy Study charts)] was reduced from 24 to 12% at 3 years. CSMO was defined as one or more of the following: retinal thickening at or within 500 μm of the center of the macula, hard exudates at or within 500 μm of the center of the macula if associated with adjacent retinal thickening, or an area or areas of retinal thickening one disc area in size, at least a part of which is within one disc diameter of the fovea . Conventional photocoagulation using a single application of laser energy per shot is usually delivered as a 100–200 ms duration burn. This is time consuming and uncomfortable for the patients and doctors, especially in panretinal photocoagulation (PRP) . The advent of multiple spot lasers, such as the Vitra Multispot (532 nm Green Nd:YAG; Quantel Medical, Bozeman, MT 59715, United States) or the Supra Scan 577 (577 nm yellow multispot or micropulse, Quantel Medical), made laser photocoagulation safer, easier, and more effective . The efficacy of multispot lasers can be attributed to several changes that have been made in the treatment parameters for multispot lasers as compared with treatment parameters for conventional lasers. The exposure time to the laser has been reduced and the laser's power increased. The duration of laser treatment has been reduced from 100 to 10 to 20 ms. Once the laser duration is defined, the power of the laser can then be titrated from 200 mW to higher than 600 mW. Decreased duration of exposure and increased laser power result in better localization of the laser to the external retina and a reduction in thermal diffusion, which reduces the amount of epithelial scarring, scotoma, and inflammation associated with laser,,. However, the type of damage mechanism to the retinal pigment epithelium (RPE), other retinal layers, and choroid depends on the duration of the applied laser pulse. At a continuous wave to 10-ms exposure time, a pure thermal denaturation of tissue has been shown to be the primary retinal damage mechanism . As regards microsecond to nanosecond exposure times, there is evidence that RPE damage is induced by intracellular microbubble formation around the strongly absorbent melanosomes inside the RPE cell . The microbubble formation leads to the disintegration of the RPE cell structure and the disruption of the cell membrane. At subnanosecond exposures, other nonlinear damage mechanisms appear, such as shock-waves and laser-induced breakdown . Multispot laser is also less painful for the patient, as thermal diffusion in the choroid, where pain receptors reside, has been reduced. Multispot laser allows spots to be delivered almost simultaneously and with greater regularity compared with conventional treatment. The spots are delivered in a 3 × 3 or 4 × 4 matrixes, allowing more spots to be delivered in a shorter period of time, thus reducing the total time of treatment . Previous studies found that the Pascal photocoagulator (multispot laser) was fast and effective, with rapid learning. Although the short pulse duration of the Pascal necessitated the use of high power, it was not associated with adverse effects . This study was a prospective and randomized one. It was carried out on diabetic patients who came to the 'Research Institute of Ophthalmology in Giza' between February 2015 and December 2015. The study protocol was approved by the ethical committee of Menoufia University. The study was explained to patients and written informed consent was obtained from the patients. A total of 50 eyes were included in the study and divided into two groups. Group A included patients with even numbers and group B included patients with odd numbers. Group A patients underwent focal, grid laser, or modified grid macular laser photocoagulation for diabetic CSMO using conventional laser (green laser 532 nm GYC-1000). Treatment parameters were as follows: duration range from 50 to 100 ms, spot size range from 50 up to 100 μm, and power range from 50 up to 300 mW. Group B patients underwent focal, grid laser, or modified grid macular laser photocoagulation for nonproliferative diabetic retinopathy using multispot laser photocoagulation. The multispot laser system (Valon TT, 1670 Vantaa, Finland) is a 532 nm frequency-doubled (Nd:YAG) solid-state laser. Duration ranged from 10 to 20 ms, spot size ranged from 50 up to 200 μm, and power ranged from 50 up to 300 mW. Inclusion criteria were as follows: diabetes mellitus type 2, visual acuity (VA) snellen decimal equivalent of 0.1 or better, newly diagnosed severe nonproliferative diabetic retinopathy, mean central retinal thickness (CRT) of not more than 500 μm as measured using optical coherence tomography (OCT) scans, and adequate pupil dilatation and clear media to perform laser photocoagulation and OCT. The exclusion criteria were as follows: planned PRP within 6 months, previous retinal treatment either laser or surgery, any previous ocular condition that may be associated with a risk for macular edema, such as epiretinal membrane, vein occlusion, uveitis, etc., uncontrolled hypertension, renal failure, mental illness, poor glycemic control, or planned intraocular surgery within 6 months. Before laser, all participants were subjected to detailed ophthalmic examinations. Duration of diabetes mellitus was obtained, and average fasting blood glucose 2 weeks before laser photocoagulation therapy and recent glycosylated hemoglobin level within 3 months was obtained. The patients were examined for their best-corrected visual acuity (BCVA) and slit-lamp examination including dilated fundus examination and fundus flourescein angiography, and OCT of the macula was performed. All patients were examined on the first day after laser using slit-lamp examination with dilated fundus examination and applanation tonometry. Thereafter, all patients were re-examined at 1 week, 1 month, and 3 months after laser, including BCVA, applanation tonometry, slit-lamp examination with dilated fundus examination, and OCT.
Statistical analysis was performed using IBM SPSS (v 20; IBM Corp., New York, New York, USA). Descriptive statistics were calculated and the data were summarized as mean ± SD, and frequencies were reported with numbers and percentages. Multiple variable line graphs were used to compare the data throughout the follow-up period. Comparisons between numerical data from the different visits were made using repeated-measures analysis of variance (ANOVA), whereas comparisons for categorical data were made using the c2-test or Fisher's exact test. The results were considered statistically significant with a P- value of less than or equal to 0.05. The study included 25 (50%) eyes of male and 25 (50%) eyes of female patients; for six patients, both eyes were included in the study. The mean age was 57.72 ± 9.08 years for group A (argon) and 55.52 ± 6.84 years for group B (Valon). The patients underwent either focal (treating all leaking aneurysms in the edematous retina) or modified grid laser (treating only areas of thickened retina and the leaking aneurysms). The results were compared in terms of efficacy, including central macular thickness (CMT) and VA, power requirement, and adverse events. The VA of the patients was measured before laser and during the follow-up period at 1 week, 1 month, and 3 months. 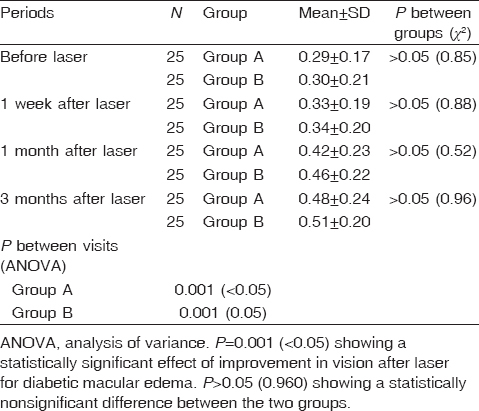 The mean preoperative BCVA in group A with conventional laser was 0.294 ± 0.1715 decimal and that in group B with multispot laser (Valon) was 0.3040 ± 0.2140. The mean BCVA 3 months after laser in group A was 0.4820 ± 0.244 decimal (P = 0.001) and in group B it was 0.5080 ± 0.1977 (P = 0.001). There was no significant difference between the two groups in improving the VA (P = 0.96, ANOVA) [Table 1]. CMT of the patients was measured before laser and during the follow-up period at 1 week, 1 month, and 3 months. The mean preoperative CMT in group A was 375.92 ± 65.69 μm and that in group B was 361.0 ± 50.400 μm. The mean CMT 3 months after laser in group A was 314.44 ± 85.94 μm (P = 0.001) and that in group B was 0322.668 ± 57.50 μm (P = 0.001). There was no significant difference between the two groups as regards improvement in macular thickness (P = 0.121, ANOVA) [Table 2]. In group A, the mean power was 100 ± 19.4 mW, spot size was 50–100 mm, and burn duration was 50–100 ms. The mean number of burns was 80 ± 7.4. In group B, the power was 155 ± 90.1 mW, spot size was 50–100 mm, and burn duration was 10–20 ms. The mean number of burns was 150 ± 88.3. Statistically significantly higher powers and number or burns were used by the multispot laser (P = 0.001, ANOVA) [Table 3]. Group A patients underwent modified grid laser with conventional laser. The mean treatment time was 10.02 ± 2.21 min. Group B patients underwent modified grid laser using pattern scan laser, and the mean treatment time was 2.55 ± 1.32 min (P = 0.001). There was a statistically significant difference in time between the two groups. Pattern scan laser uses lesser time compared with laser to produce the same effect. In group A, three patients had no improvement in macular edema and VA and two cases worsened; these five cases required intravitreal injection. In group B, three patients had no improvement in the macular edema and VA and required intravitreal injection. No complications related to laser treatment were noted in any patient. No effects were observed in blood vessels if the array inadvertently involved a retinal area traversed by blood vessels. Our study was comparable to another study by Salman , which was a prospective randomized case series study, but the difference was in that the comparison was not only in modified grid laser but also in PRP. Similar to our study, both procedures had successful outcomes and also significantly higher powers were required with the Pascal (145 mW) than with conventional laser (100 mW) in eyes that underwent focal/modified grid macular treatment with both systems. In another pilot study by Sanghvi et al. , who tested the Pascal photocoagulator on 26 eyes, significantly higher powers were used for Pascal (143 mW) compared with conventional (100 mW) treatment. Chappelow et al. investigated high-risk proliferative diabetic retinopathy (PDR), which was treated with PRP using either argon green laser or Pascal. Patients treated with the Pascal and argon laser received a similar number of spots (1438 vs. 1386; P = 0.59). Patients treated with the Pascal were more likely to experience persistence or recurrence of neovascularization within 6 months of initial treatment (73 vs. 34%; P < 0.0008). Hence, it can be concluded that when using the pattern scan laser the treatment parameters should be changed to produce the same effect as the conventional argon laser. In this study, although they did not specifically measure retinal lesion size, they deduced that the total area of PRP scars in the argon-treated patient exceeds that of the Pascal-treated patient. Either additional lesions or larger spot sizes may be required to achieve comparable efficacy with the Pascal compared with traditional argon green laser. The efficacy of the multispot laser can be identified through the improvement of the VA and CMT. As regards BCVA improvement, our study was comparable to the study by Modi et al. , who studied 28 eyes of 17 patients. These 28 eyes were divided into two groups, group A underwent macular grid laser and group B underwent PRP using the pattern scan laser (Pascal). BCVA was stable or better in 66% (14/21). In our study, the mean preoperative BCVA in group B using the multispot laser changed from 0.3040 ± 0.2140 to 0.5080 ± 0.1977 3 months after laser. In the study by Salman , the BCVA improved in the group that used the conventional laser (0.30–0.22 logMAR), and in the group that used pattern laser it improved from 0.30 to 0.25 logMAR. As regards the improvement in macular thickness, Modi et al. reported that the average central foveal thickness on ocular coherence tomography improved in 71% (15/21). This is in agreement with our study as the mean preoperative CMT in group A decreased from 375.92 ± 65.69 μm in group A and 361.0 ± 50.400 μm in group B to be 314.44 ± 85.938 μm in group A and 322.668 ± 57.500 μm in group B, which is a good successful outcome. Moreover, the effectiveness of the multispot laser was revealed in the study by Jain et al. . There was a reduction in central OCT thickness of 40 and 37 μm in the spectral domain and time domain OCT groups, respectively, both of which were statistically significant (P = 0.0049 and 0.012, respectively). The time element of treatment is also important for both the patient and the doctor. The use of the multispot laser shortens the treatment time of the patient with the same therapeutic effect. In this concern, another randomized clinical trial was made by Muqit et al. to investigate the effects of pattern scanning laser multispot PRP given in a single-session (SS-PRP) versus single-spot multiple-session PRP (MS-PRP) on PDR. A positive effect on PDR was observed in 74% of eyes in the SS-PRP group versus 53% in the MS-PRP group (P = 0.31). There were no significant differences between the two groups in terms of VA improvement but the mean treatment time for SS-PRP was 5.04 min (SD, 1.5 min) compared with 59.3 (SD, 12.7 min) in the MS-PRP group (P < 0.001). This means that the treatment time decreased using the multispot laser but producing the same therapeutic effect. These results are in agreement with our study. Group A underwent modified grid laser with conventional laser. The mean treatment time was 10.02 ± 2.21 min. The mean treatment time was shorter in group B (2.55 ± 1.32 min). Thus, the treatment time using multispot laser is shorter, but it is as effective as conventional argon laser. The higher power levels required with the multispot system did not result in any complications. This may be a reflection of the reduced laser energy per burn reaching the eye secondary to its shorter duration. Fluence is calculated as (power × time/area), and provided that spot size remains unchanged, with a burn duration of 20 ms the fluence is less than with a 100 ms burn when titrating to the same burn intensity because of reduced diffusion of heat . In our study, we found good safety of pattern scan laser as there were no intraoperative or postoperative complications in 3-month follow-up periods. In the study by Salman , no complications related to laser treatment were noted in any patient. No effects were observed on blood vessels if the array inadvertently involved a retinal area traversed by blood vessels. The limitations of our study were the low number of patients and the short follow-up period. More studies are needed in a large scale of patients for better evaluation of the efficacy of both types of laser and prolonged follow-up periods up to 1 year. Multispot laser was safe, rapid, and effective in the treatment of CSMO in short-term follow-up periods. Although the shorter pulse duration of the pattern scan necessitated the use of high power, it is not associated with adverse effects. It has comparable results to the historical results with conventional retinal photocoagulation. Roider J, Brinkmann R, Wirbelauer C, Laqua H, Birngruber R. Subthreshold (retinal pigment epithelium) photocoagulation in macular diseases: a pilot study. Br J Ophthalmol 2000; 84:40–47. Early Treatment Diabetic Retinopathy Study Research Group. Photocoagulation for diabetic macular edema. ETDRS report no. 1. Arch Ophthalmol 1985; 103:1796–1806. Guigou S. Multispot laser photocoagulation. Retina Today 2014; 1:1. Blumenkranz MS, Yellachich D, Andersen DE, Wiltberger MW, Mordaunt D, Marcellino GR, et al. Semiautomated patterned scanning laser for retinal photocoagulation. Retina 2006; 26:370–376. Nagpal M. Clinical experience with a high-speed multispot laser. Retina Today 2008; 3:76–78. Muqit MM, Marcellino GR, Henson DB, Young LB, Turner GS, Stanga PE. Pascal panretinal laser ablation and regression analysis in proliferative diabetic retinopathy: Manchester Pascal Study Report 4. Eye (Lond) 2011; 25:1447–1456. Vogel, A, Lauterborn W. Acoustic transient generation by laser-produced cavitation bubbles near solid boundaries. J Acoust Soc Am 1988; 84:719–731. Brinkmann R, Huettmann G, Rogener J, Roider J, Birngruber R, Plin C. Origin of retinal pigment epithelium cell damage by pulsed laser irradiance in the nanosecond to microsecond time regimen. Lasers Surg Med 2000; 2:451–464. Roegener J, Brinkmann R, Lin CP. Pump–probe detection of laser-induced microbubble formation in retinal pigment epithelium cells. J Biomed Opt 2004; 9:367–371. Salman AG. 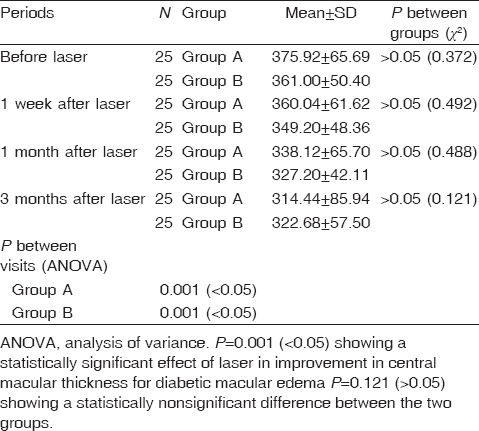 Pascal laser versus conventional laser for treatment of diabetic retinopathy. Saudi J Ophthalmol 2011; 25:175–179. Sanghvi C, McLauchlan R, Delgado C, Young L, Charles J, Marcellino G, Stagna PE. Initial experience with the Pascal® photocoagulator: a pilot study of 75 procedures. Br J Ophthalmol 2008; 92:1061–1064. Chappelow AV, Tan K, Waheed NK, Kaiser PK. Panretinal photocoagulation for proliferative diabetic retinopathy: pattern scan laser versus argon laser. Am J Ophthalmol 2012; 153:137-42. Modi D, Chiranad P, Akduman L. Efficacy of patterned scan laser in treatment of macular edema and retinal neovascularization. Clin Ophthalmol 2009; 3:465–470. Jain A, Collen J, Kaines A, Hubschman JP, Schwartz S. Short-duration focal pattern grid macular photocoagulation for diabetic macular edema: four-month outcomes. Retina 2010; 30:1622–1626. Muqit MM, Gray JC, Marcellino GR, Henson DB, Young LB, Patton N, et al. In vivo laser-tissue interactions and healing responses from 20- vs 100-millisecond pulse Pascal photocoagulation burns. Arch Ophthalmol 2010; 128:448–455. Bailey CC, Sparrow JM, Grey RH, Cheng H. The national diabetic retinopathy laser treatment audit III. Clinical outcomes. Eye (Lond) 1999; 13:151–159.